I was an avid book buyer till recently. Yes, a book buyer. At any point of time, there would be at least five unread books on my table. And none of my travel packing was complete without stuffing in two – three books at least. Even if it is a two day trip. This was about six months back. Then I got the IPAD and things never remained the same. A majority of books I have read this year are in the e format. 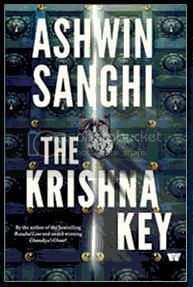 But then, The Krishna Key by Ashwin Sanghi had to be an exception. The e format book was not released alongside the main book, and I wanted to lay my hands upon it as soon as possible. I had read Ashwin’s previous book Chanakya’s Chant sometime last year, and had loved it. Ashwin has this unique style to blend history and draw parallelism with present day life in an efficient manner making it an entertaining read. The book is very well researched, and the footnotes at the end of the book just prove it. There is a lot of information, and every conspiracy theory ever heard of finds it way in the book. The Mahabharatha story has very nicely been integrated into the beginning of each chapter in a brief and concise manner. In the initial parts of the book, it is very fast paced and prompts you to turn to the next chapter by building a good suspense every now and then. As the book progresses, the data becomes so tedious, and everything seems to be placed so conveniently that you lose track of the main story. The convoluted screenplay adds to the woes. Characters enter and leave without a purpose, and it all seems like a set play narration in front of you, with the belief factor decreasing with every chapter. I know it is a fiction story, and is not supposed to be focusing a lot on believability, but then random happenings and planned heists, cannot be passed off as coincidences so many a times. Ashwin has used all the conspiracy theories ever to have surfaced in this realm, and mixed them all into a story. He seems to have ensured that he uses all the mail forwards ever done. The story in a nutshell – a young man, is led to believe that he is the Kalki – the final avatar of Krishna (also known as Vishnu in Indian mythology) and is on a murderous rampage to seek the secret. Professors get murdered, bike and car chases Ensue, deceitful dealings occur, and it all ends like any popular Hindi Movie ending. The high point of the book is the teachings by Lord Krishna to Arjuna during the war. The gist of the Bhagwad Gita is explained in a very succinct, to the point format. This has actually now provoked me to read the Bhagwad Gita from the beginning. Overall, the verdict is, if you have read Chankya’s Chant or the Rozabal line and liked it, there are chances you might like this book as it follows the same pattern of story telling. For those of you who have not read any of the author’s two earlier books, you should definitely give this book a try just for the way the story is treated. Toujours trÃ¨s rÃ©jouissants les textes de DÃ©sirÃ©e oÃ¹ (y a pas hiatus Jean-Paul) se dÃ©veloppe sous nos yeux un petit monde grouillant et gesticulant, textes parsemÃ©s de jeux de mots savoureux comme « l’humour secret de Colas Rififi ».On a envie d’y ajouter « et un raton laveur » cher Ã PrÃ©vert, un raton Karcher pour faire plus moderne !